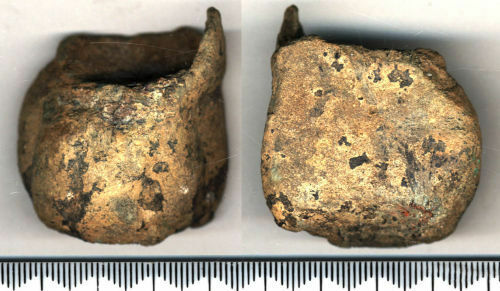 Cast copper-alloy leg from a vessel. A five-toed foot survives, 39 mm wide and 25 mm thick, with a groove separating this from the upper part which is D-shaped in cross-section. Only a tiny part of this exists, with an irregular U-shaped top covered in grey solder. It seems likely either that this foot broke off its vessel, and had to be replaced, or was cast as a replacement to a broken-off foot. The latter seems more likely as the edges of the top are not clearly broken. Vessels with these feet date from the mid thirteenth to the end of the sixteenth century.